Clothes have long been favorite gifts to give and to receive . . . so today I'm very happy to announce a fun give-away of a T-shirt from Signals, but first I want to share with you a couple other gift ideas which Signals sent to me at no cost in exchange for my opinions in my review . . . I LOVE the color and texture in this bag! I'm extremely happy it is lined and has a zipped pouch inside as well as a pouch for my cell phone - I always have so much trouble finding my phone in my purse! Zipper close - helps me feel like I'm less likely to have things fall out . . . or for people to reach in my purse without me noticing! It is currently on SALE - you can save $30.00 - this is a great sale, so if you know someone who might love this purse, get a jump-start on your Christmas purchases and save serious money! 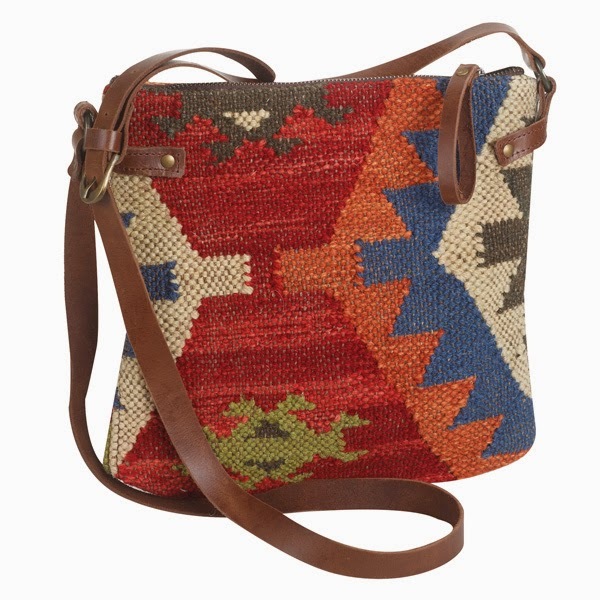 Signals has this to say about the Kilim Crossbody Bag; "Colorful wool kilim, woven by hand and fashioned into a bag you'll use every day. The inside is lined with cotton and finished with a patch pocket and a zipper pocket. Brown leather strap adjusts 48"-51". Antiqued brass buckle and rivets, zipper top. 11" square. Imported." I really love this purse! I love the colors and textures, the features and just the size and style . . . it is a fun purse and definitely is one I'll use every day! It is a great gift idea for someone on your list - or as a treat for you! This is a truly lovely scarf/wrap. Available in silver - which is what Signals sent me - or red. Signals has this to say about the Treble Clef Pashmina; "Elegant treble clefs and musical notes are woven in a luxuriously soft pashmina wool blend; warm but lightweight. Reversible wrap--one side is dark, the other is light --measures 27" wide and 68" long, plus black fringe at both ends. Available in red or silver." I think this is one of the most lovely scarves/wraps I have ever seen. It is simple in it's design, yet truly lovely; it will be a wonderful and stylish way to dress up or add a great accent to jeans and a sweater. 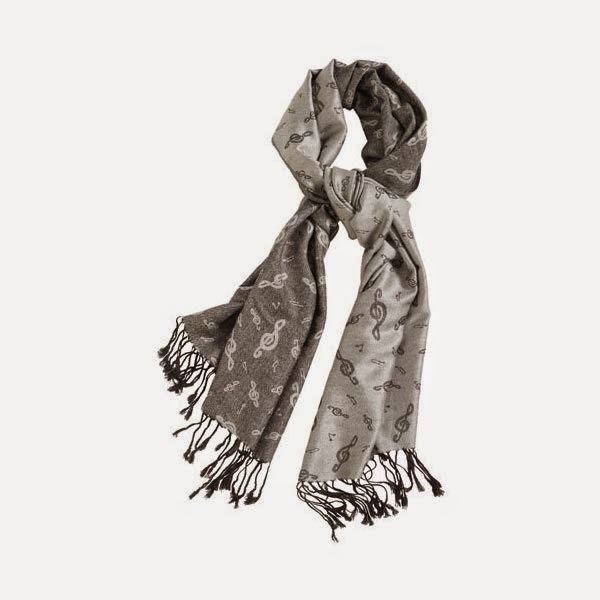 If you have someone on your gift list who loves music and scarves; this is a truly beautiful gift! T shirts have long been favorite staples to our wardrobes . . . and a tshirt with something funny on it makes a light-hearted gift which is sure to be used! Signals sent me one of their clever t-shirts . 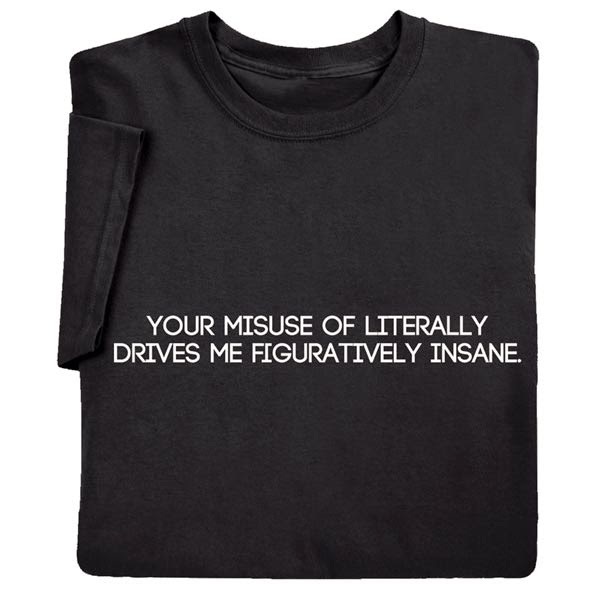 . . this one says: "Your misuse of literally drives me figuratively insane". Definitely a fun tshirt! Signals says; "Literally means 'exactly'. Figuratively means 'not in a real sense'. But we all know it's a losing battle. And some people could care less. T-shirt is preshrunk 100% cotton. Sizes M-XXL. Imported." I think it is just fun and makes a fun item to give to someone on your gift list! These are just three of the fun, unique and creative items which you will find on Signal's website - check them out as you plan your Christmas gift list . . . you are very likely to find the perfect gift for people on your list! I'm very happy to say, I'm giving this fun t-shirt away (USA only)! If you are over the age of 18 and would like to be in the drawing for the Your Misuse of Literally T-Shirt (USA only) which will be on November 29, 2014, please comment below to let me know what a t-shirt would look like if you could design it! For me, it would depend on who was going to wear it: my son would have to have something on it about coffee or cars and I'd have to have photos of my grandsons and family on it for sure! In addition, you will receive additional entries if you have followed on Google+, Google Friend Connect, followed by liking on facebook with the tab at this link (not just liking the post) and/or have followed grandma's cookie jar by email. For each of these which you have done you will receive one entry. In addition, if you "share" this post, you'll receive an additional entry (please let me know if you share). This will help me be able to draw names from among people who would like to win the Your Misuse of Literally T-Shirt and it gives you several ways to enter the give-away! I would have a yellow brick road going up to heaven or something...liked, shared , follow Google+, email, FB,...my son has autism, he would love this shirt . I would love an iron chef parody tshirt.